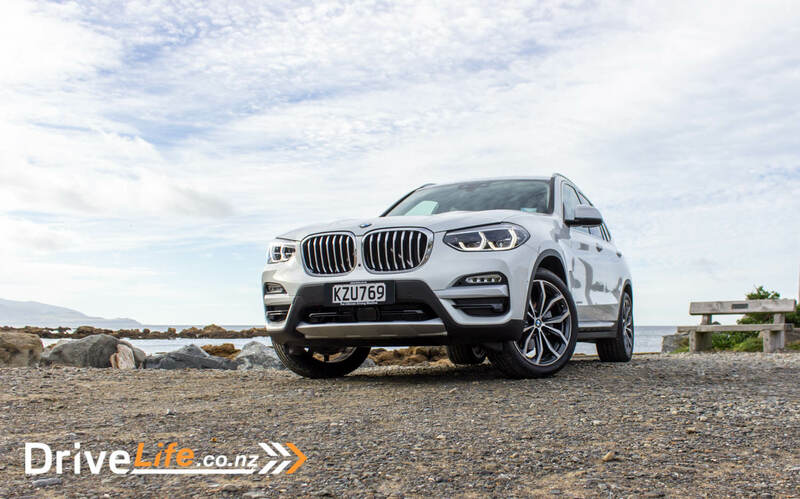 After BMW sent us to the release of the X3, well I was pretty blown away. It was hard to fault the car, it seemed to do everything so well. But as always, that was only a few days of driving. It was time to take the X3 on as a Daily Driver for a week to see what it’s really like to live with. 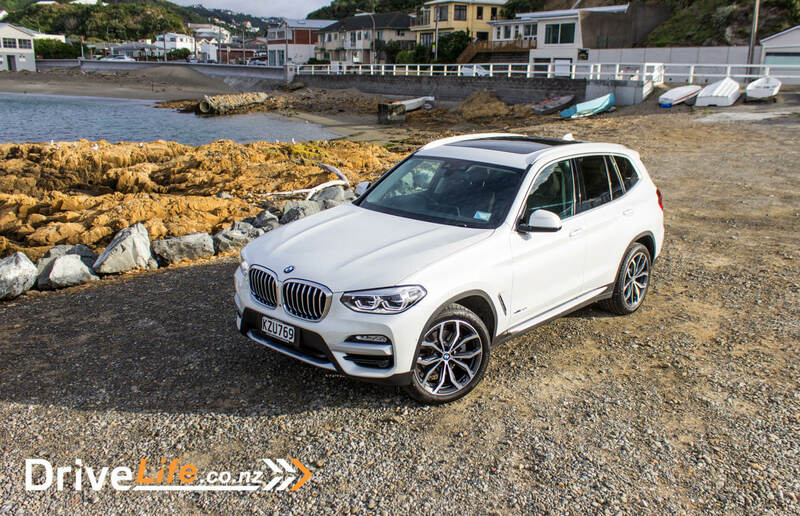 BMW sent us the midrange model – an xDrive30i – to see if was as good as we found it during the launch. 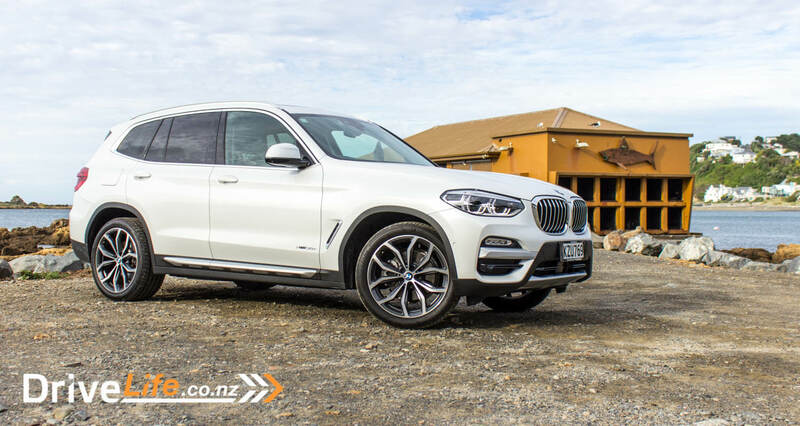 You get three X3 models to pick from in New Zealand; the only diesel model the xDrive20d ($92,850), then there’s the xDrive30i ($99,850) and the M40i at $119,850. All are fitted with an 8-speed automatic gearbox. The 20d comes with a 2-litre twin-turbo diesel engine that gives you 140kw of power, and 400Nm of torque. The 30i comes with a 2-litre twin-turbo 4-cylinder petrol motor, which pumps out 185kw and 350Nm of torque. The only six-cylinder is the turbo M40i putting out a respectable 265Kw of power and 500Nm of torque. Standard equipment on any X3 is reasonable. 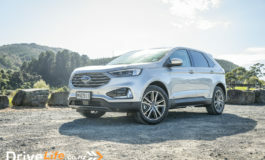 Even the base model gets keyless start, 19” alloys, ambient lighting with ‘welcome light carpet’, LED headlights, high beam assist, auto wipers, Driving Assistant Plus, adaptive cruise control, Parking Assistant, front and rear parking sensors, rear-view camera, dynamic stability control, Brake Assistant, Cornering Brake Control, Dynamics Traction Control, active headrests, Hill Descent Control, wireless phone charging, DAB tuner, SatNav, a 10” touch display, multifunction instrument display, 6-speaker audio system, Concierge Services, Real Time Traffic information, 3-zone AC, an electric tailgate, all windows one touch up/down, fine-wood oak trim, electric front seats with memory for the driver, and leather upholstery. 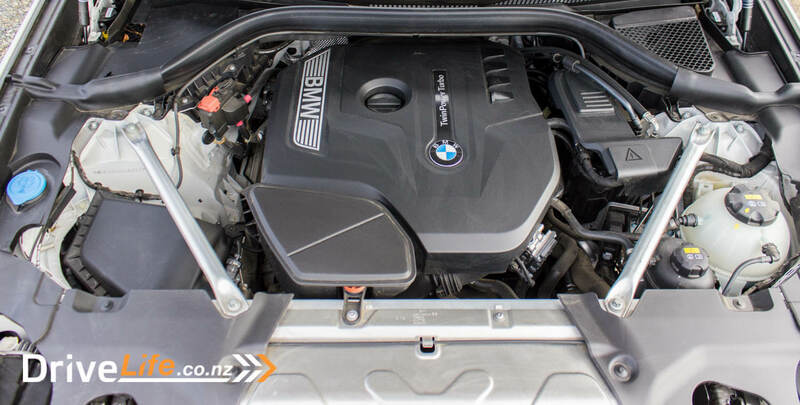 Other than the different engine, the xDrive30i doesn’t add too much more to that, other than 21“ alloys, adaptive LED headlights, Comfort Access System, run-flat tyres, a Heads-Up Display (HUD) and Parking Assistant Plus (including a 3D Surround View). For your extra $20K, the top of the range M40i moves to 21” alloys, Adaptive M suspension, a Harmon Kardon surround sound system, LED fog lights, electric lumbar support adjust, M Aerodynamics package, M leather steering wheel, M Sport Brakes, and heated front seats. And you get that delicious turbo six-cylinder motor of course. Our test car was fitted with over $16,000 in optional equipment, including Dynamic Damper Control, Instrument panel in ‘Sensatec’, luggage compartment separating netting, lumbar support, metallic paint, Apple CarPlay, seat back adjustment for the rear seats, seat heating for driver and passenger, sun protection glazing, an electrically folding tow-bar, and the Vision and Sound package. These extras brought up our test car up to $116,140. 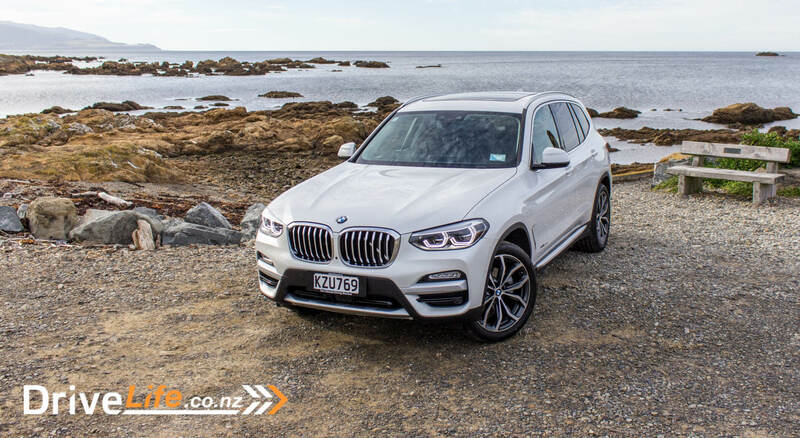 The X3 sure is all grown up now, and looks pretty darn fine, especially in the Mineral White metallic of our test car. It’s definitely got the BMW family look going, and that’s probably what a lot of buyers are going for. Can’t quite afford an X5? The X3 is just a little smaller, but is almost a twin in looks. There are two silver bars that run behind the grille, at a 45 degree angle. They stand out from behind the grille at certain angles, as they are painted silver. I wonder why BMW didn’t paint them black so they don’t show. Still, it’s not a biggie, just one of those weird things that surely has a reason, but I’m not sure what that is. At the sides and rear, BMW have tidied up the clumsiness of the car; where the sides used to be too busy, there’s now some nice sculpturing and a better overall design. The wheels on our test car looked superb; this is something BMW does well. 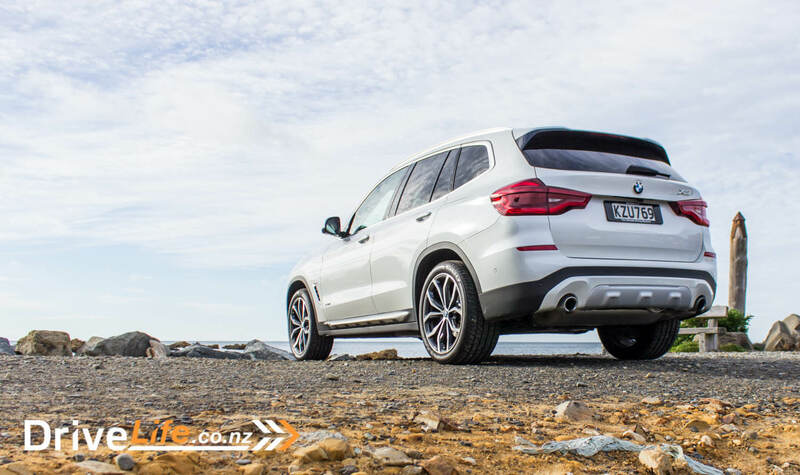 They can make or break a car’s look, and they looked excellent on the xDrive30i. The rear just looks like a smaller X5, and that’s not a bad thing. The 2017 X3 is bigger overall than the original X5. How times have changed. 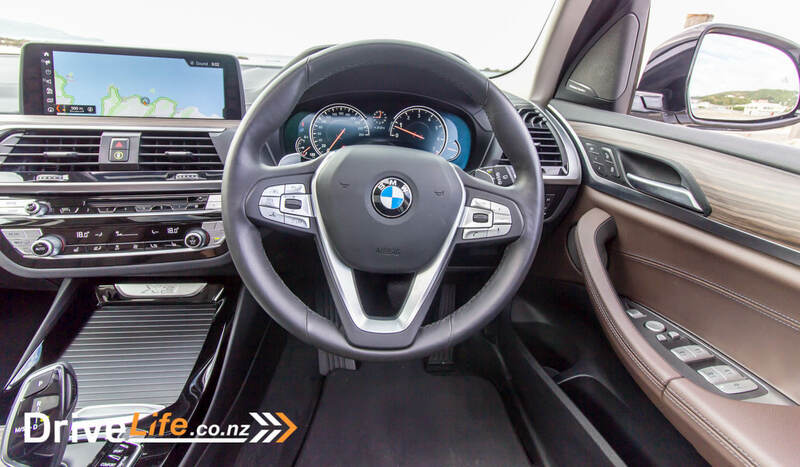 Opening the door of our test X3 brought me smiles – brown leather! While I just lurv red leather, brown is the next best option. There’s far too much black leather out there, and the ‘Mocha’ of our test car looked stunning. It was on the seats, doors, and centre console. A few people didn’t like it, but they were well in the minority. The ‘fine-wood trim oak’ looked fantastic on the doors, dash and centre console – and felt fantastic too. After a few cars with fake wood, it was nice to touch actual wood for a change. It’s even got an embossed feel to it, just to prove it’s not a sticker. It’s one of those things where you know you are driving a more expensive car, when the wood trim isn’t artificial. Some didn’t like it, but it felt old school and cool to me. There’s also quite a bit of piano black in the car, and touches of silver here and there. The whole cabin looks and feels classy. Night time sees red hue lighting on the doors and in the interior, and it was worth going for a night drive to check this out. Sure, it’s a Guy Thing, but it looked really cool. Using the car at night means you also get to see the ‘Welcome Carpet Lighting’. 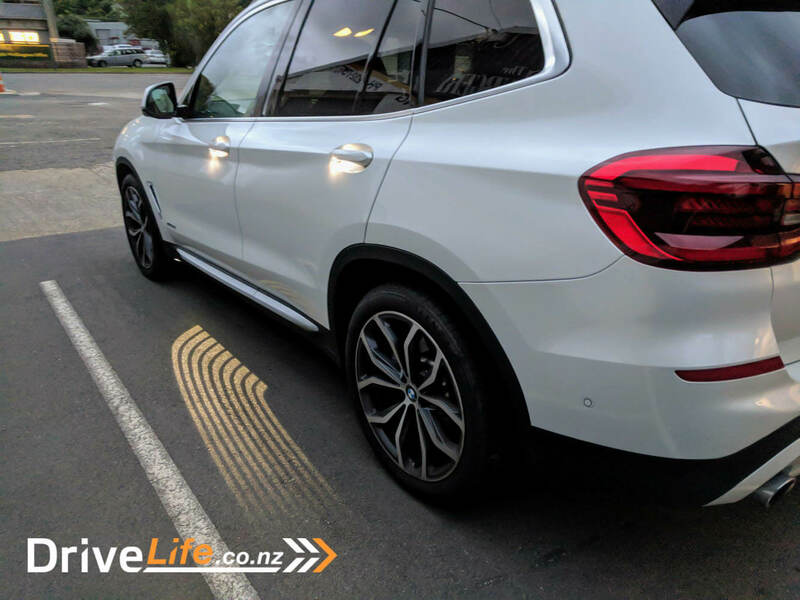 While some cars project the car’s logo onto the footpath or road when you open a door, the X3 throws a whole lot of light down in a nice arc instead. It borders on a bit naff, but I liked it. Being a BMW SUV, there weren’t any surprises on the inside. 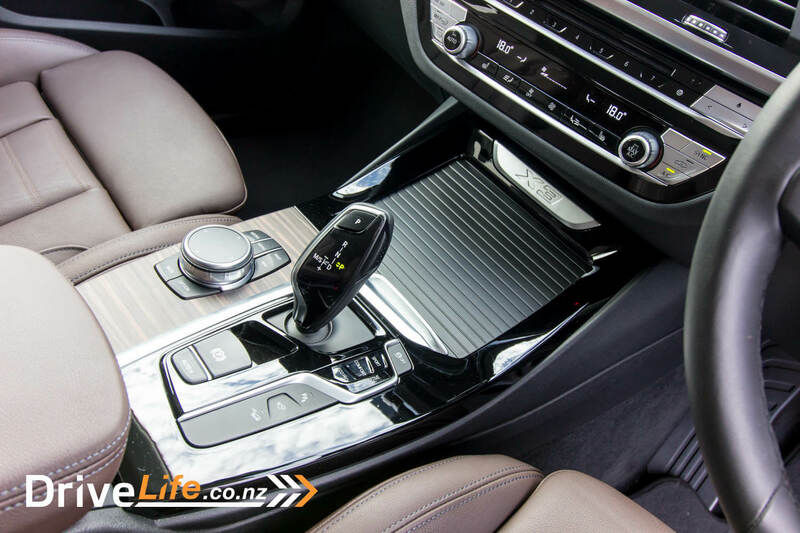 You get the same excellent shifter, the same iDrive controller, and you also get no complaints. Nearly everything works perfectly, most things you need fall to hand, and the build quality is as you would expect for a car touching $120K. Helping things along is the huge panoramic sunroof, tilt/slide of course and fitted with a flip-up wind deflector. It was nice to see that after walking away from the car, I could hold down the lock button on the key and it would close the sunroof if I had left it open. Cool touch. 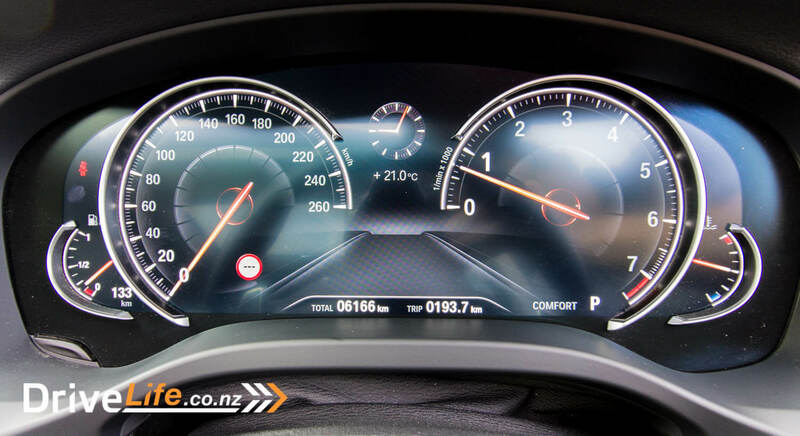 Front and centre of the car is the high-resolution 10” touchscreen display. This includes gesture control for things like audio volume, but again I tried to make it work, and failed. I felt like an idiot at the traffic lights, waving my finger around in circles, like Harry Potter without his wand. In the end I gave up and used the steering wheel controls, or the actual buttons and knobs that you can adjust the volume, change tracks etc. The driver’s seat has an electric side bolster adjustment for both front seats, but weirdly the seat cushion extension adjustment is manual. It’s pretty simple – just a lever under the cushion, but I thought this would be electrically controlled too. Steering wheel adjustment is manual also. The front seats themselves are top-class; hard but not overly so, comfortable on a long trip, and a huge range of adjustments. However, I passed the X3 on to someone else who is larger than me (in the Drive Life team) for a week, and he didn’t find the same comfort levels. You can set the heated front seats to turn on automatically at a given temperature, which isn’t something I’ve seen before. 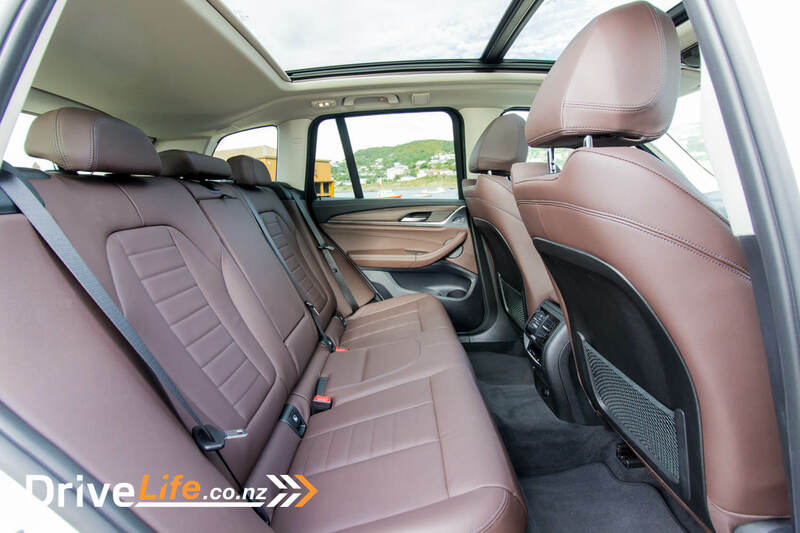 Rear seats are pretty much the same on the comfort rating, and rear legroom is excellent, and visibility for rear-seat passengers to great too. So many cars keep their passengers down low and/or with tiny side windows, which can bring on car sickness. Not so the X3. All X3s have wireless cellphone charging (if your phone is capable) and I used this all the time. 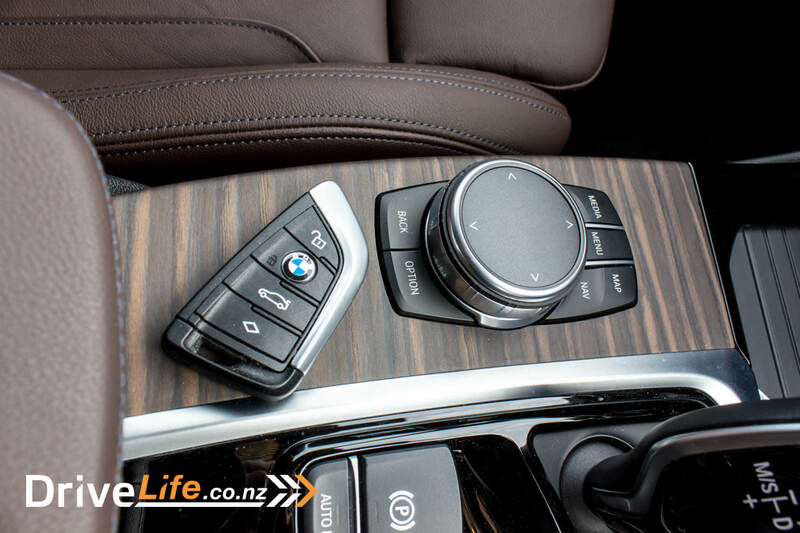 BMW was the first manufacturer that allows you to use Apple CarPlay via Bluetooth, instead of having to plug your phone in via USB cable. You do have to pay extra ($500) to have CarPlay functionality. 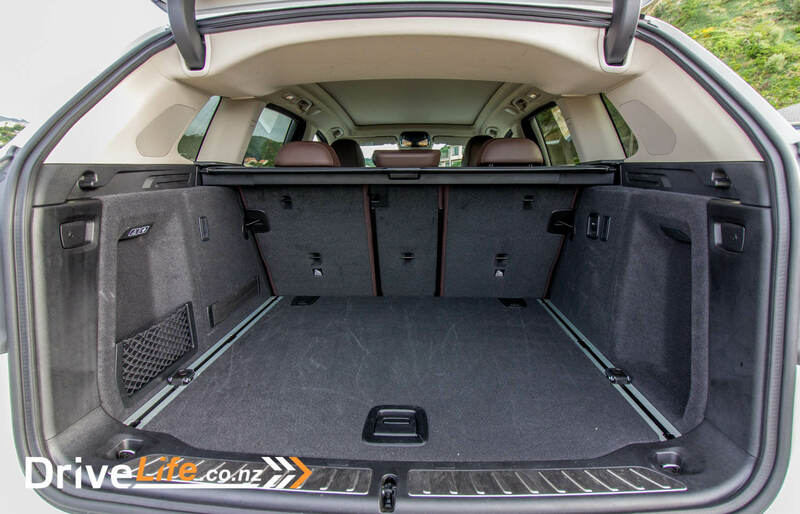 The boot on the new X3 has a very usable 550 litres of space with the seats up, and an excellent 1600 with them down. 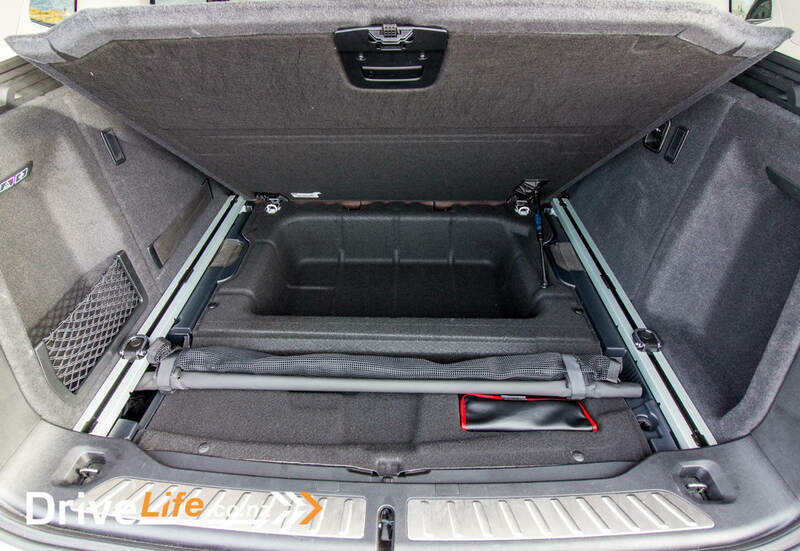 If you lift up the bottom of the boot (it’s held up with a gas strut, a nice touch) then you’ll find another good-sized cubby in there of unlisted size – but a great place to put wet towels and stuff after a day at the beach. Also stored under the cover is the cargo net (optional extra). 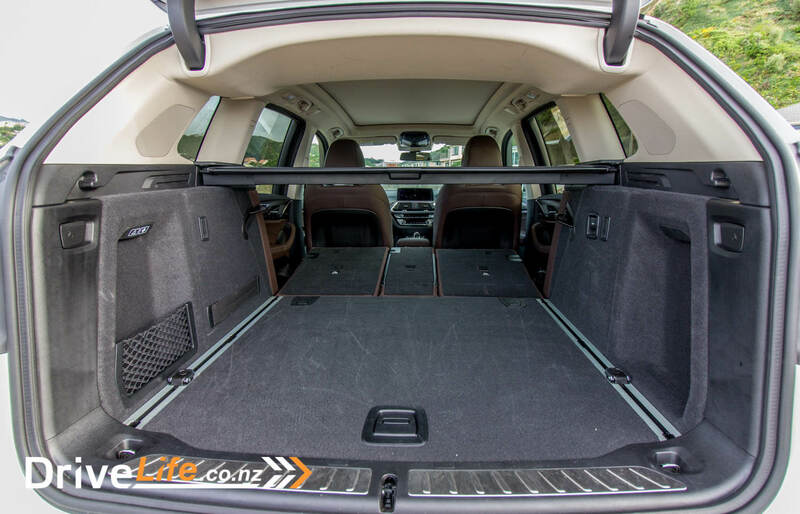 There’s no spare in here of course; the xDrive30i is fitted with run-flat tyres. 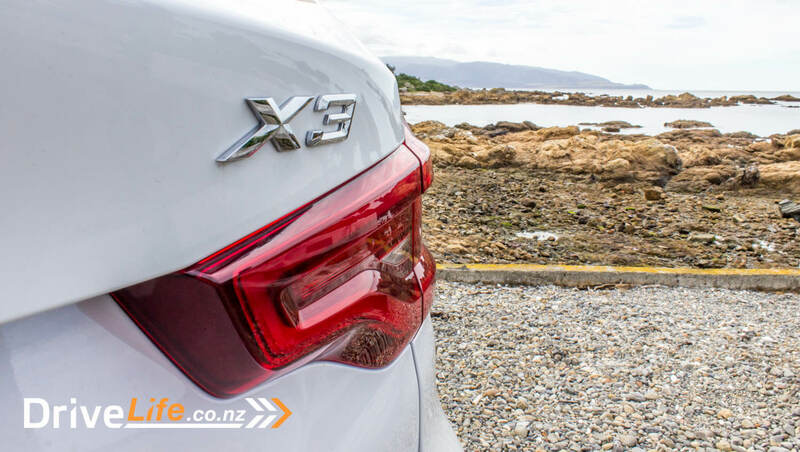 After attending the launch of the new X3, my lasting memory was of the drive. It seemed to do everything well. After a week with the car, it still leaves that impression. This is a car that drives brilliantly, and this is the mid-range model; the M40i is even better. Ride, cornering, handling, steering, braking. 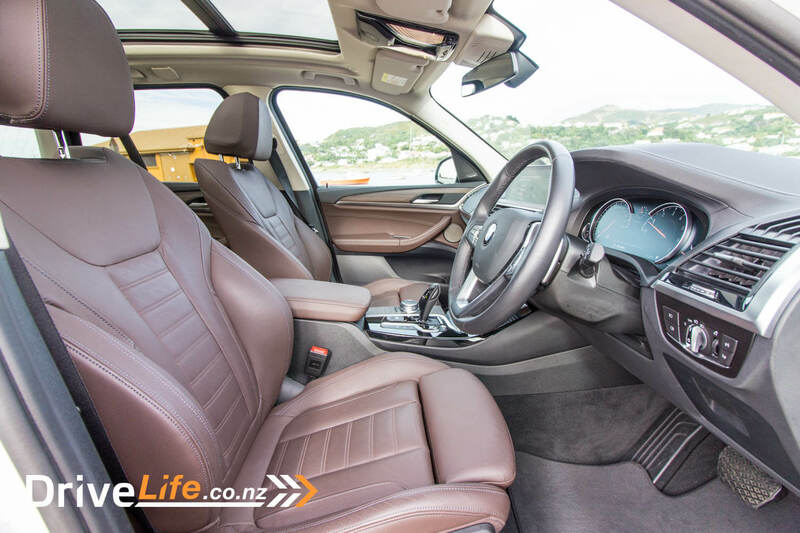 None of these things needs any special comments – the X3 does all these things very well. So what’s it like to live with as a Daily Driver? I’d happily live with the X3 every day. 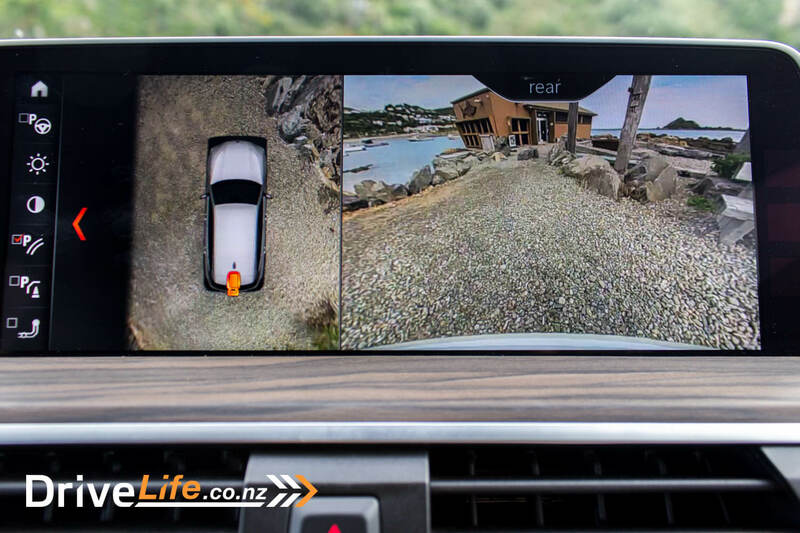 Visibility is excellent, aided by the 360-degree viewing system (multi-view camera). BMW have hit this one on the head; it’s so good and so well integrated into driving and parking. Brilliant stuff, BMW. That engine…what a piece of engineering. The performance is very good, and like too few cars, driving it in Eco mode all the time is perfectly acceptable. Off the mark and mid-range – even in Eco mode – is excellent. A shame that Eco mode doesn’t stay set when you get out of the car, I found myself having to switch it back to Eco each time I started the car. 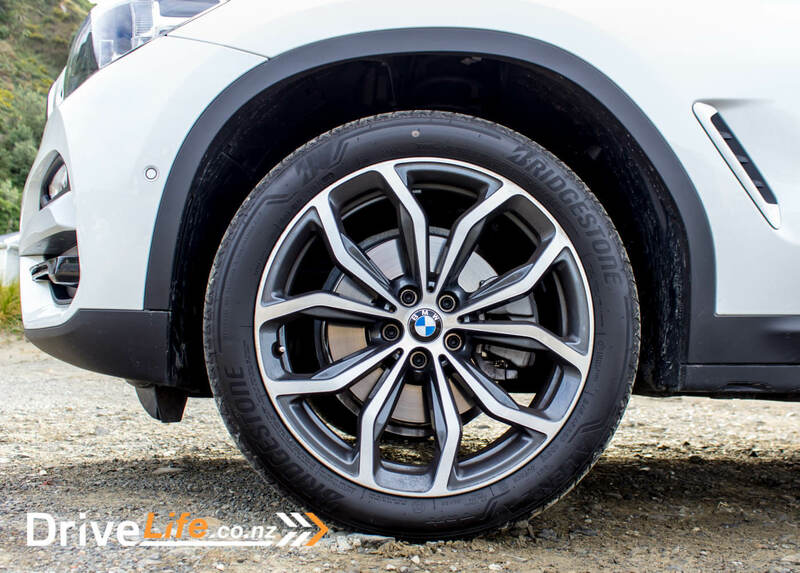 The AWD of the X3 gives you the surety of grip whenever it’s needed, and even full-throttle acceleration doesn’t see any wheel spin, just an instant surge forwards. It’s a great motor. Engine noise is low – can’t think of another way of saying this. It’s barely audible on the open road and even around town, is well subdued. That’s not to say it isn’t sporty sometimes; in the right conditions, you can get a nice little growl coming from that twin-scroll turbo that will put a smile on your face. It sounds like an old-school BMW straight-six sometimes. Added to the engine is the 8-speed auto transmission – another masterpiece. Perfect gear choice, all the time. The combination of this motor and ‘box is spot on. Switching the car in Eco mode sees the gauges go blue, with the tacho switching to an economy meter. If you are in a sporty frame of mind, switching the car to Sport will see the gauges go red, and performance instantly gets more eager. You don’t really need Sport mode for performance – normal mode is just fine – but it was fun to try it out. When you want to pull down from any speed, the brakes are there to back you up. Fantastic performance from the brakes, and the feel from them is excellent. They will give any driver confidence in the car’s ability to stop quickly and without drama. A test slamming the brakes on at 100km/h was no problem; I stopped quickly and with no fuss. Wind and road noise is kept well down too, even on the motorway. In fact overall NVH is top class, and I don’t recall hearing any tyre roar at all. At night, the directional headlights are superb, and all X3s have auto high-beam assist, so you can just drive it and know you are getting the best lighting possible. At last, and I think for the first time (for me), BMW have also mastered the Auto Hold system for the electric park brake. In other cars, when you turn on the auto hold system, it goes off again with the key and you need to turn it back on when getting back into the car. Not in the X3. Turn it on, it stays on. They’ve also got it sorted when working with the auto-stop feature for the engine. In so many cars, when auto-hold takes over at the lights, the engine turns off. When you take your foot off the brake, the engine starts again, thinking you are moving off. But you aren’t. The X3’s engine stays off until you touch the accelerator. A few other manufacturers have this right, and it’s nice to see some thought going into this. It’s not rocket science. 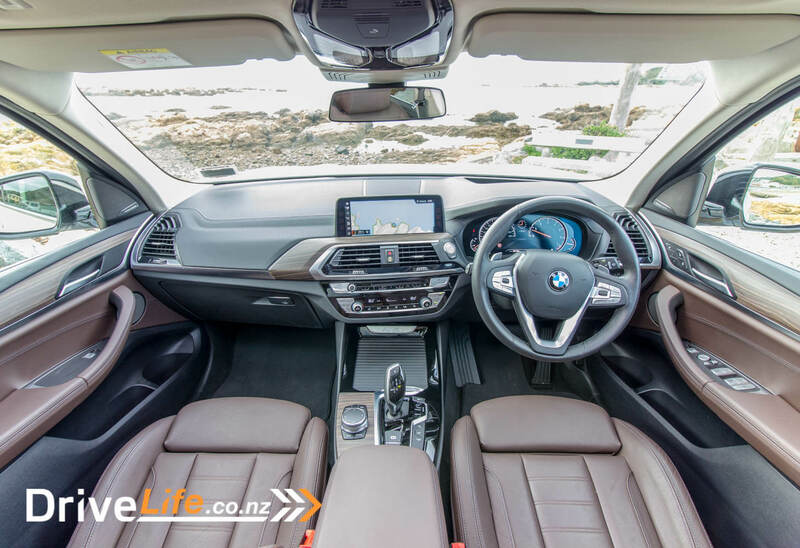 The X3 has BMW’s Driving Assistant Plus system. I’d last used this on the 530 and it worked fine on that car. It works okay on the X3, but it felt more aggressive than in the 530. At times I was fighting against it on the motorway, as the car wanted to follow the wrong lines. After four days, I turned it off. Some work needed in this department. 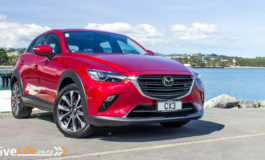 Along with Driving Assistant plus is adaptive cruise control. Instead of just sticking it on as standard equipment, BMW have gone and looked at the usability. I simply love that to use adaptive cruise on the X3, you just hit one button on the steering wheel, and it’s done. It makes a mockery of other manufacturers that make you hit the cruise control button, and then hit the ‘set’ button. This one is so simple you wonder why it’s taken so long to change it to work like this. Brilliant. On the inside, that HUD is one of the best in the business. It shows almost every piece of info that you need to know at a quick glance; speed, SatNav directions, and other vital stats. 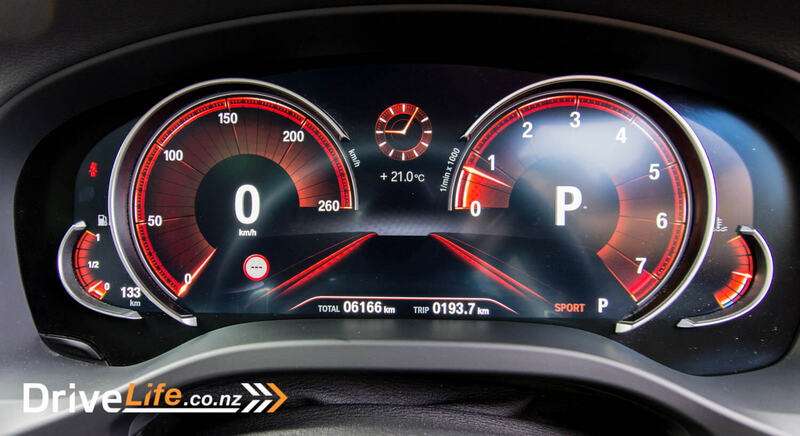 I liked that the speedo turns read if you exceed the limit for the road you are on – that’s a good safety feature. 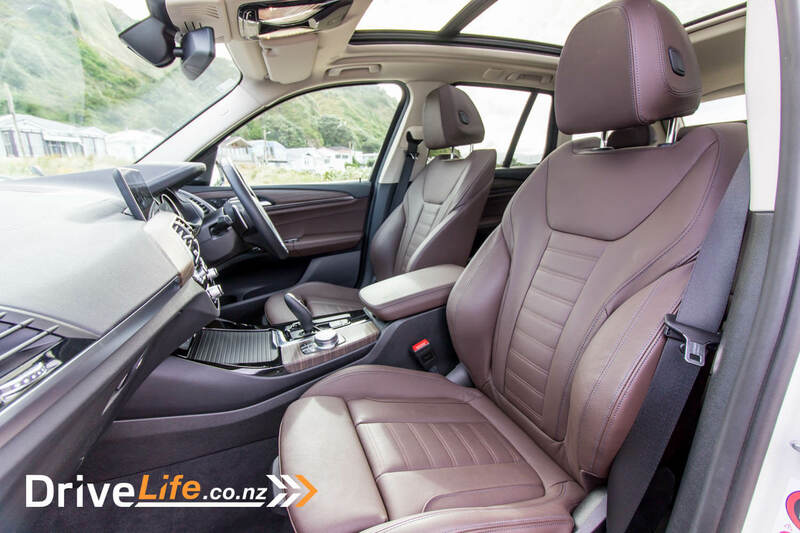 John from Drive Life had the X3 after me, and he did not like this feature, and found it a bit distracting. You can turn this feature off in the menu system, if you want to. Even if you get too close to the car in front for the speed you are travelling at, up pops a warning right in front of your eyes. The only thing it didn’t seem to show me was what gear the car was in – even if you had it in Sports mode. One other thing with the HUD – to adjust the height of it, or any other aspect, you have to troll through the menu system to find it. Mitsubishi showed the way with the Eclipse Cross VXR we recently tested – just put some buttons right there to the right of the steering wheel, so there’s no wasting time looking through a menu to find the adjustment. GM do it this way as well for their cars fitted with a HUD. Speaking of the menu system, it’s pretty easy to use on the whole. Want to rearrange the main screen icons? Just touch one button, then drag and drop them where you want. Simple! 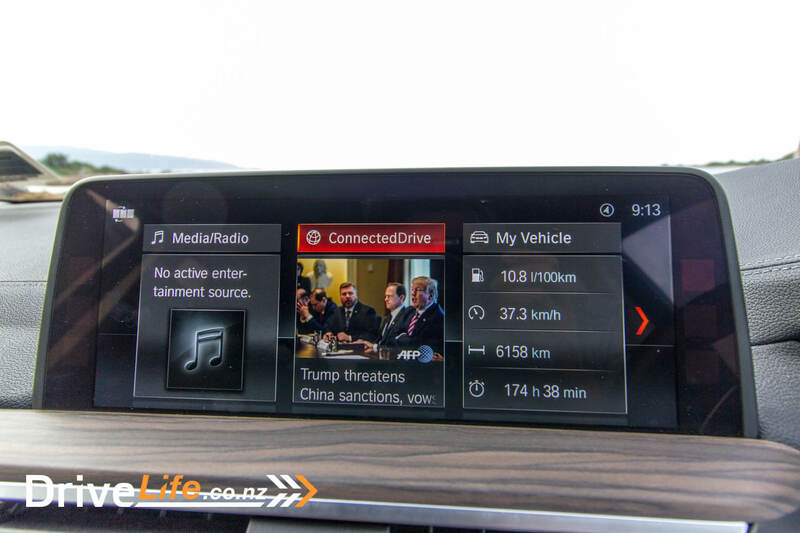 Using your phone’s internet connection, you can get a news feed up on the screen as well as SatNav, media etc. The quality of the screen is first class, too. Sound from the Harmon Kardon audio system is superb, with clear treble and some excellent bass. All was not roses with our test car though. The air conditioning seemed to have a mind of its own, and no matter what I did, either didn’t work at all or gave me full AC blast. No doubt something wrong with our test car, I’ve not seen this issue on any other BMW. My wife very much liked that not only could she adjust the temperature on the passenger’s side of the car to what she wanted, she could also individually adjust the air flow. So while I had my side of the car going to my face and feet, she had hers to her face only. That’s a nice touch. Fuel economy was a bit of a mixed bag. 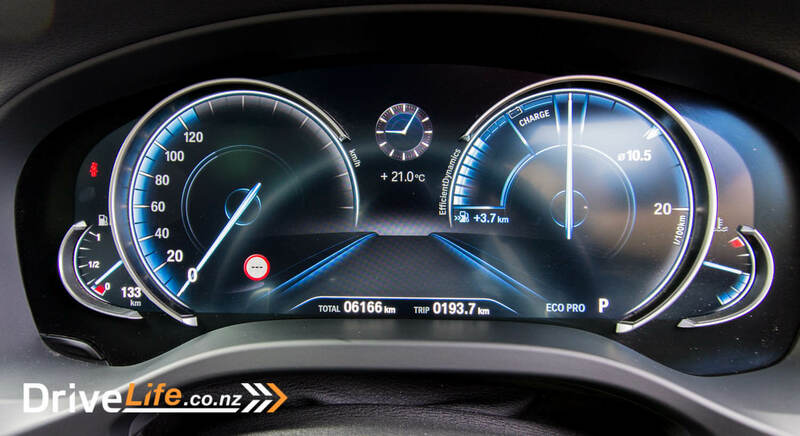 BMW claim a combined rating of 7.6litres/100km, while my average was 10.8. Quite a difference. Worth it to drive with that engine? 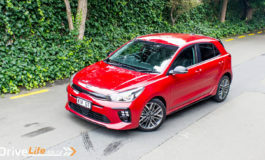 Perhaps, but still a high figure for a 2-litre, four-cylinder. 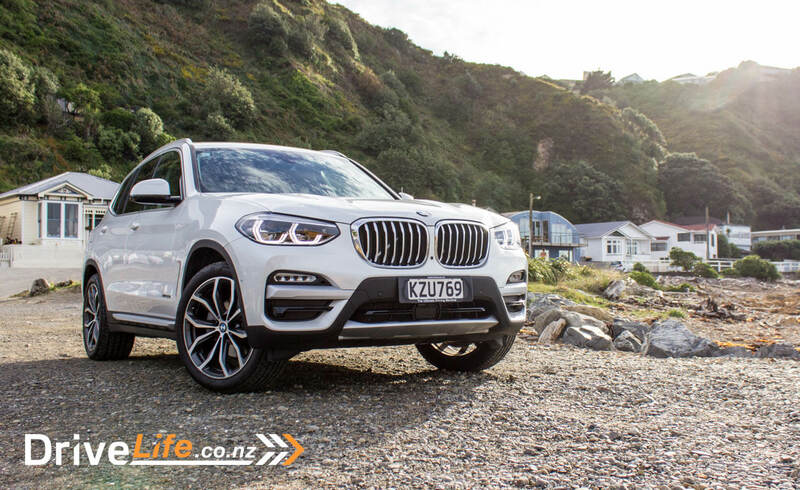 It’s hard to fault the X3 xDrive30i. It was as good over a week as it was for the launch, and that doesn’t always happen. Looking at the comparison chart makes it tricky for the X3 though. There are some great options in a mid-size SUV in this price bracket. Could you turn away from the Macan or even the brilliant Volvo XC60, when the Volvo is $15K cheaper? This may be one of those ‘buying it because it’s a BMW’ things. And that would be a shame. The X3 has a whole lot going for it. Will the M40i we have on test soon hit the 5 Chevron rating? Stay tuned.